Want to integrate Daylite and other apps you use? Thanks to Zapier integration, you don’t have to hire a developer to build custom plugins or integrations with Daylite. Zapier makes it easy for you to build your own automation workflows in just a few simple steps! With Zapier integration you can automate more to reduce double entry, human errors, and help you save time so you can accomplish more, faster. Have you ever wanted to capture new leads on your website and automate pulling those right into Daylite? Automate that with Zapier! When someone fills out a form on your website, Zapier can pull those leads right into Daylite as new People, Companies, and/or Opportunities. You can even setup a Smart List in Daylite for these new web leads. Read this Help article to learn more. Want to publish your calendar online so leads and clients can easily book meetings and calls with you and your team? Want those new appointments to show up in your Daylite calendar without having to manually create them yourself? Automate it with Zapier! Zapier allows you to pull new events from online scheduling apps like Calendly and YouCanBookMe right into Daylite. Read this to learn more. Do you use MailChimp to send out newsletters and email campaigns to lead and clients? Want to automate creating a new contact in Daylite when someone subscribes to your newsletter? Automate this with Zapier. Read this to learn more. If you’re not using Facebook to get new leads you’re missing out on a powerful resource for your business. And if you’re not sucking those leads right into Daylite to track them, you’re missing out on some major productivity gains! Using Zapier integration, you can automate pulling new leads from Facebook Lead Ads right into Daylite as new People, Companies, and/or Opportunities. You can also automate tagging these new leads with the Keyword such as “Facebook Lead Ad”. This way you can create a Smart List of all the new leads from Facebook so you can follow-up with them. Using this Keyword also makes it easy to report on how much new business you’re getting from your Facebook lead ads. Read this Help article to learn more and visit our Facebook Lead Ad Zap. Want a reminder task in Daylite when you get a new bill in Xero? Or how about a new task to let you know you got a new voicemail through CallHub? Using Zapier integration you can automate creating new tasks in Daylite from other apps. Read this to learn more. Do you use Google Forms to capture new leads on your website? Or to manage sign-ups for an event? How about to collect email addresses for a newsletter? Want these contacts easily added to Daylite without the work of manually entering it yourself? Using Zapier integration you can automate creating new People, Companies, and Opportunities in Daylite from Google Forms. Read this to learn more. Want to send out online surveys via social media to try and attract new leads? Want to pull those leads right into Daylite so you can easily follow up with them and turn them into clients? Using Zapier you can automate this workflow. Read this to learn more. Zapier makes it easy for you to create your own custom automated workflows without needing a developer. Visit our Zapbook to see all the different Zaps available and even create your own Zaps to start automating more! Zapier integration is exclusive to Daylite Cloud as it uses technology not available with Daylite Server. 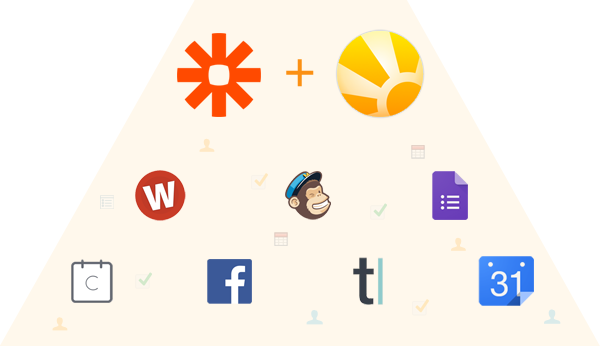 Want to take advantage of more integration options like Zapier? Contact us about moving to Daylite Cloud and save 24% with the Loyalty Upgrade Plan.